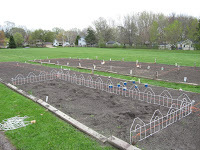 Ahh, finally time for the community gardening to begin. This ought to make someone wonder about my sanity, but .... come on, it's more fun this way. 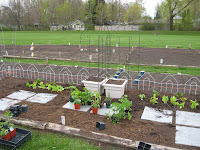 Last year I had more comments about why anyone would want to put "flowers" in with their boring rows of vegetables. Well, besides aesthetics, flowers help bring pollinators to the garden. 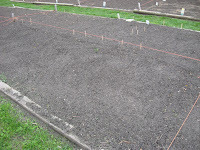 This year after the gardens were tilled, I added 2 cu/ft of peat for its moisture and nutrient holding ability. Then came some 10-10-10 granulated fertilizer. 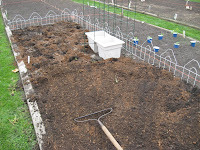 I raked all that in and smoothed it out, after filling the planters. 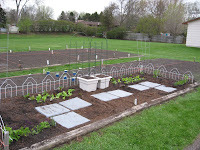 I am envisioning the pole beans on the trellises, the larger greens and chard to the back fence line.... the lettuces by the stepping stones.... I have some cilantro and parsely on the side along with some of that sweet Steveia. I hope to try a little lemonade this year sweetened with Steveia. 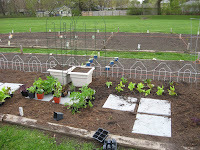 There will be two heirloom tomatoes in the corners with some onions (I think). 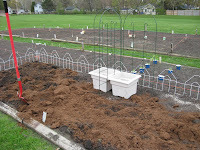 The small areas to the side will be for a short row of beans and the front will be filled with flowers. That ought to make everyone "happy".